Mt. 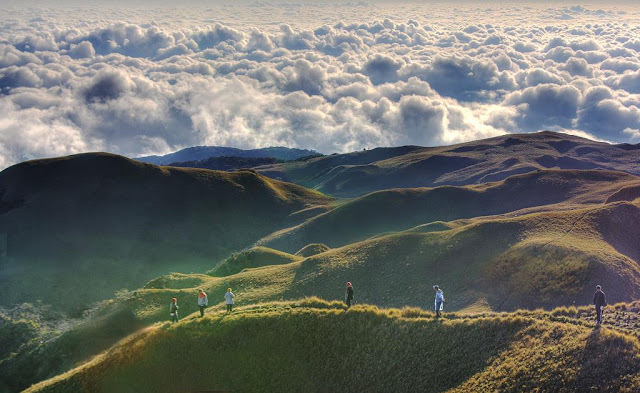 Pulag is the third highest mountain in the Philippines, at 2,922 meters above sea level. It is located within the municipalities of Buguias, Kabayan and Bokod in Benguet, Tinoc in Ifugao and Kayapa in Nueva Vizcaya. It is home to 528 documented plant species like the endemic dwarf bamboo and Benguet pine. It has 33 bird species and several animals like the Philippine Deer, the cloud rat and the long haired fruit bat. Mt. Pulag is also home to different ethic tribes like the Ibaloi, Kalanguya, Kankana-ey, and Ibanag, and most of them consider the mountain as sacred land. The mountain gained popularity among mountaineers and those who are new to the hobby because of the "sea of clouds" phenomenon. Climbers also get to appreciate lush mossy forrest and the grassland summit. There are four major trails up the summit: the Ambangeg, Akiki, Tawangan and the Ambaguio trail (from Nueva Vizcaya). 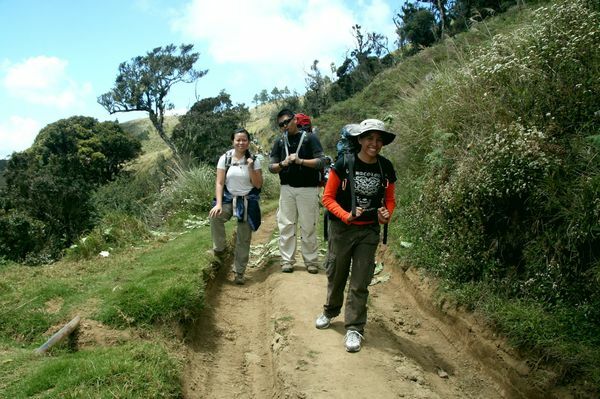 These trails are managed by the Mount Pulag National Park, under the Department of Environment and Natural Resources. I think from among country's national parks, Mt. Pulag is the most well-managed, under the tutelage of Ms. Emerita Albas. 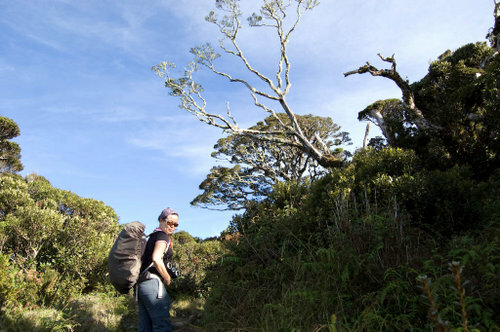 For beginners, The Ambangeg-Ambangeg Trail or the executive trail is recommended. It is the easiest trail. Climbers start at an already high altitude, at Badabak Ranger Station. The summit is approximately 8 kilometers from this jump-off point. The trail is relaxing, with few steep parts. Climbers can rest at Camp 1, which has a hut. then proceed to Camp 2, the ideal camp location. There is a nearby water source (your guides can get water for you), latrines (haven't seen this one) and a really awesome view of the grassland. If you are lucky, you will be blessed by an amazing sunset like this. The summit from camp 2 is approximately 2 hours. Usually campers leave an hour or two before the crack of dawn to catch the glorious sunrise at the summit of Mt. Pulag. Really cold weather. It can go negative from the months of December to February. It doesn't snow here but there were a few instances where ice particles formed on the grassland. That's how low the temperature can go in Mt. Pulag. Hypothermia is a possibility. Persons with asthma or other pulmonary conditions must get doctor's advice. Be ready also for possible allergies. Oh, and the jeepney ride from Baguio to DENR is nauseating. Be prepared. What to wear? What to pack? Prepare for really cold weather. Jackets are a must. Pack also bonnets, scarves, gloves, socks and thermal underwear if you have, plus your own medication and first aid kit. For the trek, bring trekking shoes, lightweight pants and dri fit shirt. Bring your sleeping bag and earth pad. If you are joining a group, you may coordinate on food and other equipment like tent, cookset and stove. Oh, of course, have enough trail food. Don't forget to waterproof everything. How to arrange a climb? Jeepneys must be arranged from Baguio to Badabak Ranger Station. It is best to leave Manila at night and arrive in Baguio City before dawn, then travel from Baguio to the jump-off. It is a four to five hour ride, including breakfast stop at Jangjang (where we usually have breakfast), photo stop at Ambuklao Dam and very important, briefing at the DENR station. All climbers are required to attend briefing. Don't worry, you'll learn a lot about Mt. Pulag and mountain climbing ethics. Unfortunately, Mang Roger died last year but his business was taken over by cousins. They use the same number according to friends (0920-8068656). Norton Buses (Northern Transit Terminal Station, Magsaysay Avenue) bound for Kabayan Benguet may also be taken. 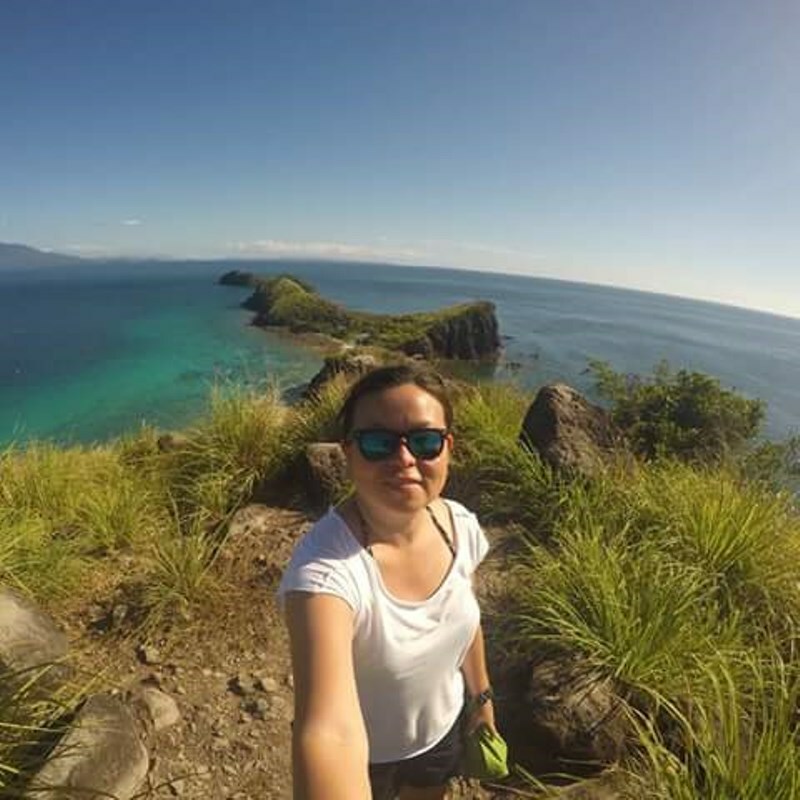 Permits, guides and porters if needed must be arranged in advance with Ms. Abas (0919-6315402). Please use smart phone when texting Ms. Abas. Most guides are self-contained and they have a hut to stay at Camp 2, but please allocate food for guides and porters. How much to climb Mt. Pulag? Entrance fee is Php 100.00 per head, Camping Fee is Php 50.00 per head. Green fee is Php 50.00 per head. Guide fee is Php 100.00 per head. When to climb Mt. Pulag? Mt. Pulag is accessible year round. If you up for it, then climb during the early part of the year, when the weather can go to the extreme. Your food will also be well-preserved. If there's clearing, the sea of clouds is magnificent. Summer months are also okay, but the sea of clouds may not be that fantastic. During extremely bad weather, like rainy season, it is possible for the jeepneys not to reach the ranger station. Clear skies (or clearing) may also be elusive. Wow abot kamay ang mga ulap. I like the images especialy the images with formation of clouds. No problem. Would appreciate a photo credit though. Thanks! Hi Kelly, I would like to know kung safe ba umakyat sa Mt. Pulag with a toddler na kasama mga 3yrs.old ang age. Any advise? Thank you! I already saw a 3 year old climb Mt. Pulag but I can't say it is safe. There are still risks involved. Hello po,, saan mo pwde mag rent ng tent good for 3 at magkano po?